A couple of years ago, I had grieved when Margaret Moseley cut down a perfectly healthy 'Yuletide' sasanqua. She had it paired with a sourwood she planted about the same time, knowing that the leaves of the tree would echo the color of the blooms. She cut them both down because they were threatening the view of another favorite camellia, which is in her iron bird bath garden (one of many, many groupings she's changed over the years). Last week, I understood about the 'Yuletide.' She had told me she had another one, and I couldn't believe how it had grown. I took a photograph of the entire plant (surely, there must be two planted together), as the red blooms with yellow stamens seemed to extend to some twenty feet wide. The sasanqua had grown to about 15 feet tall. There is definitely something in Margaret's soil that makes things grow bigger and better than elsewhere. A friend of mine has these espaliered against a wall. I need to ask him if they are in bloom. Margaret's have been going for at least a month, and on December 4th, it looked as if a giant had dropped another crop of sasanqua blooms all over her garden. It began yesterday, or was it the day before? I found the first of the long, velvety pods of the evil wisteria that has haunted me for years. When I moved here in August 1973, I was so naive. I planted things that could not possibly grow in the deep shade surrounding our little 1926 cottage. It was if I lived in a place similar to Red Riding Hood's grandmother's house - smack in the middle of the woods, without a house in sight. All around me were giant trees - mostly hardwoods - that shaded everything. My first spring here was magical, though. It was if I lived in a purple mansion, with flowers cascading down off every tree, and vines connecting above my head to form a fragrant roof. It truthfully wasn't for years that I realized that evil lurked around me, that the wisteria vines that were impossible to pull up and difficult to cut had ruined the forest floor and threatened to take down some of these mighty trees. More years passed before I realized that the long, tan pods that formed after flowering contained smooth, flat seeds that were dispersed everywhere when said pods burst open with an explosion. Year before last, the wisteria seed pods appeared on my driveway in February. This year, it's December. So far, I've only found the open pods. The seeds are already everywhere in the woods and will hide out until they germinate in the spring. But, what I actually want to talk about here is the timing of the garden, especially this year in the case of 98-year-old Margaret Moseley. I went out to her garden in late October, and the sasanquas were blooming like mad. In fact, many of the petals had already fallen, making a pastel carpet on the ground and in her driveway. This is a shrub she began collecting almost 50 years ago. Her plantings have paid off, making for a gorgeous and long autumn season. The pink, white and rose-colored blooms are stunning against the yellowing hostas and Solomon's seal and the multi-colored leaves of the oakleaf hydrangeas - altogether a strange, but beautiful contrast. Here's what I found amazing. I went back on December 4th to get Margaret to sign 90 copies of A Garden to Remember. Before I went into the house, I walked around the garden. I had expected to see camellias starting to pop, thinking the sasanquas - all except for 'Yuletide' - to be over. It almost seemed miraculous that all these sasanquas that had put on a show in October were again in full bloom. The 25-foot-tall shrubs and all of the lower ones as well, were smothered in flowers. How had there been that many buds in the first place? We'd had freezes in low 20's in the interim which would have done away with all the flowers. But here, on this December day, the garden was in full bloom - not the camellias but the very same sasanquas I'd seen over a month prior. I'd figured the flowers would be long gone by this time. I guess I should not be surprised about this. Margaret's shrubs for the most part are decades old and well-established. I don't recall this ever happening before, though. True, when you see her shrubs in September, you can't believe how many buds there are. The same is true of her camellias. 'Lady Clare', a popular Camellia japonica was already in bloom, along with 'Daikagura'. But, it was as if the sasanquas had just reached their first peak. Gardeners are always saying, "This is not a typical year." I don't know that we've ever had a typical year, at least not for a long time. But, I think this fall was a phenomenon, at least as far as the sasanquas were concerned. The timing of a garden depends on a lot of factors, I'm sure. Why this year turned out like it did is a mystery. I'll have to ask Margaret if she remembers another year like this. She's worked hard to make sure there's something in bloom every day of the year, and I think she's succeeded very well. This garden was once a sloping lawn down to a cul-de-sac turn around. The owner, who for decades has been a mover and shaker in the garden community and hosted Rosemary Verey on her visits to Atlanta, turned this once blank area into a welcoming front courtyard. The pavers lead to her front door. The stone and gravel and the spare use of foundation plantings create a look you'd see in the south of France. A mix of evergreens - camellias, cryptomeria and magnolia (to the right of the camellia) serves as a backdrop for deciduous shrubs and trees. In spring, a yellow Lady Banks rose cascades over a tree near the front door. Photo taken on December 15th. Today, I'm thinking about where and how friends and relatives are celebrating Thanksgiving. For example, according to a posting on Facebook, my nephew and his wife and four boys are on a cruise, presumably in the Caribbean. My friend Benjie and some friends have spent Thanksgiving together for decades. Each person or couple brings a dish, and they rotate homes every year. At least three of them are decorators, and cleverness counts when it comes to the table settings. When it was Benjie's turn a few years ago, I drove over to his house and took pictures of his stunning table. He hosted again last year, and I was envious of a ceramic turkey (a large one) he got off eBay. He said it wasn't expensive, maybe $12, which set me afire even more. I've always wanted one of those. Also, last year he took two large orange pumpkins and put them in a pair of magnificent antique bronze urns, set at the ends of a kitchen island. To make this combination appear even more rustic (mind you, the bronze urns are very elegant), he stuffed hay around the pumpkins. I had a moment of thinking how unoriginal my decorations were when I saw what he had done. But that's okay. All I ended up doing was using what I had on hand and what I could pick from the yard. Wait. That's not really true. My team did the Harvest Sunday arrangement for church last year(a giant cornucopia on the altar), and I splurged and bought some rose hips at the wholesale florist. I used them in an arrangement of beech leaves (picked fresh Thanksgiving morning; they dry out and curl to a crisp after a few hours). I used my mother's cornucopias on the mantel in the dining room. They were stuffed with dried okra from the farm, Mother's fake grapes, dried pomegranates, poppy pods and nandina berries (still in the orange stage), among other things found in the woods. I also included some wisps of bittersweet I picked, at great risk to injury, from the side of a nearby, very busy road. When I had run out of time, I ended up just throwing some beech branches on the pine Georgia hunt board (back in the thirties, my father-in-law found the latter on a porch in north Georgia; it was covered in white paint; the story was that he took his knife and scraped off a place to see beautiful wood underneath). Anyway, if you ignore the painting hanging crooked over it, the hunt board and the my mother-in-law's silver service and the beech leaves carelessly thrown on there turned out to be my favorite decoration. Sometimes, the simplest things can give you the most satisfaction. It is a cold and rainy and very dismal Sunday afternoon here in Georgia. I went to church and made it through until the minister said at the end, "Let's take a few seconds of silence to think about the joy of Thanksgiving and all the people who've been around our Thanksgiving tables of the past," or at least that's what I understood him to say. Well, that's a killer for me, as with great joy, I remember all those Thanksgivings of my childhood and later in my adulthood when my children and my husband and I would head down to Mother and Daddy's for a feast (all cooked by Mother, except when I was older, I did do the scalloped oysters for a few years). I've written about this before, so I won't elaborate here. It's just that I no longer celebrate with my brother and his children and their families. They all have their places to go now. And, of course, Mother and Daddy and my husband, who loved my mother's cooking so much, are all gone. That's who I thought of, of course. Every Thanksgiving since my husband's sudden death in 1999 has been different. By 2002, my parents, then in their 90's, could no longer put on the spread they had done for years. My sister-in-law and I tried to cobble together something at their house. It was the first time I'd ever had pieces of chicken in the dressing. She'd brought it from Louisiana, and it's not that it wasn't good. It just wasn't my mother's cornbread dressing, with the hint of celery and onion. I guess the worst Thanksgiving of my life, though, was the November after Mother had to go into a nursing home. I cooked all week, and my husband's sister and her family all came. I had to leave and drive 50 miles to get Mother. When we arrived back at my house, I realized I'd forgotten her wheel chair. So, I improvised. I got my rolling desk chair from my office upstairs, and she was helped into the house and sat down. We wheeled her into the dining room. That was the mistake, I think, that set her off. My mother, the warmest, most gracious and cheerful woman in the world, scowled at everything. Not only would she not touch one morsel of food, she would not even take a sip of water. Seeing it was a lost cause, I left before dessert was served and drove her back to Newnan. But, that's not the Thanksgiving table I thought of today. I concentrated on Chip and Mother and Daddy and saw us all sitting there at the big table, Mother's two cornucopias spilling fake grapes and gourds onto the linen tablecloth, our plates laden with green beans, creamed corn, lima beans (the three latter from their summer garden), turkey, dressing, scalloped oysters, sweet potatoes, cranberry salad and Mama's homemade rolls. I saw the relish tray sitting there untouched. This is not what I had intended to talk about! I wanted to describe how the scene above, which I did for the St. Luke's Park Board's November meeting, didn't cost me a cent. I took everything from the yard or from the farm, except the striped pumpkin-looking gourds, which my friend Benjie had given me. Here are the elements. You may have to look closely to pick them out: Beech leaves, nandina foliage and berries, china berries, moss I'd had in my basement for years, the fruit of Poncirus trifoliata (hardy orange) from my yard, and a strip of bark from the wood pile. I am wrong about the money. Those were oranges, apples and mangoes I'd bought to eat (you can't see that my dog had bitten the mangoes and decided against them - he has separation anxiety and does things like that), and it looks like I threw in some key limes. I always buy them when I see them, intending to make a pie, which I never do (I end up using them in iced tea instead). All this was centered around pieces from my husband's decoy collection: a goose, a shore bird and a mallard. The setting was a beautiful dining room in the venerable St. Luke's Episcopal Church on Peachtree Street. Several people have sent me before-and-after photos of their ginkgo trees this year. When I received them, I realized the leaves had all turned and fallen early, according to my photo library. But, this year was different for some of the ginkgoes around town. The ones at church never turned completely yellow before they fell. Matter of fact, I went to church on Sunday, ready to take my annual photo looking up through the golden-yellow leaves at the blue sky and the steeple, only to find the trees completely bare. I looked on the ground, and most all of the leaves were green. I called 98-year-old Margaret Moseley, and she said this is the first year the leaves have fallen before they turned. She estimates she planted her tree in the 1980's. Every year, she would monitor the tree and have her chair ready to watch the glowing yellow leaves rain down in one day. "I would sit on the porch and watch them fall," she said. "This is the first year the leaves have failed to turn yellow. I looked out today, and there wasn't a leaf on the tree. There were only green leaves on the ground. This has never happened this way in all the years I've had the tree." So, who knows what happened this year? I have dozens of pictures taken in the past of ginkgo trees putting on their spectacular fall show. I'm sure this is an anomaly, but one wonders why. One more thought: Margaret has a female tree (not a pleasant odor, although I've never noticed it). What I did see the other day were seedling ginkgoes coming up in some of her beds. I am wondering. Liz Tedder wrote to say she retrieved a seedling this way years ago. I know that unless I live to the age of Margaret, I wouldn't see a ginkgo tree in very mature form. But should I take some of these seedlings and plant them for future generations? There was a woman in Wisconsin - now deceased - who, in her 80's was planting small oak trees like crazy. She said she wanted the trees so that someone way after she was gone would be able to have shade on her blistering sunny hilltop. Maybe I'll try this at the farm. American elm trees keep coming up and succumbing to disease. Perhaps some ginkgoes would thrill whoever occupies the land decades from now. I like that idea. Above: A photo taken three years ago of ginkgo leaves in Margaret Moseley's iron bird bath garden. I've gotten much better about stopping on streets to look at trees or flowers or shrubs. It used to be that I would go around a block several times to see something extraordinary if I had no place to park. It's a wonder I never had a wreck rubber-necking (not looking at wrecks, but flowers). On Sunday as I was heading home from church, I passed these trees, and because my street is not very busy, I pulled over, backed up and got out. Every week I take my camera to church to record the flowers, so I thought I might as well capture these colors. They were absolutely blinding on a very gray day. A lot of the original houses on my sparsely populated street (it dead ends into an estate overlooking the Chattahoochee River) have been replaced by newer, bigger houses. The woman who lives here was on the street when I moved here in 1973. Her home looks modern with a Japanese feel, although I've never been inside. I've only talked to her a couple of times on the phone (our neighborhood is so spread out; I can hardly see another house from mine, even in the winter). Anyway, I do recall now that these Japanese maples have caught my eye before. On Sunday, I needed some "brightening up", so this did the trick. The owner never knew I stopped and walked up her driveway. I don't often do things like that, but I figured if she had something this eye-catching, she wouldn't mind if I shared the beauty with others. These chrysanthemums look like the ones we would find at a wholesale florist - ones that had come from South America perhaps. That's where a lot of today's flowers are grown. But the blooms you see here were growing in a long row near my home town in south Fulton County. True, the grower is a native of Bulgaria and found the inspiration for growing different chrysanthemums from his grandmother back home. But, it's a flower I think we can all identify with. I look at these flowers, and I am reminded of cold nights and high school football games - of arriving at the stadium with my parents and hearing the band already playing and the roar of the crowd. My heart would beat with anticipation, especially if our team was in contention for a championship. Actually, though, such flowers were sold on the street outside college games. Made into corsages with pipe cleaner letters attached, men would buy their dates or wives a big flower to wear. In those years, we wore suits to college games. I remember my daddy buying me a football mum as we were walking to a Georgia Tech game. I had on a tweed suit that had the exact colors you see above. If I were offered that outfit today, I would reject it. I look terrible in burnt orange and mustard yellow. Still, though, the scent of chrysanthemums takes me back to other days and good memories - first of being cold, huddled under a stadium blanket, and then later arriving home to a hot meal my mother had cooked. I wanted to add something about today's date. Who can remember November 18, 1975? For some reason I do. I had been married for two years. The previous May I had ended my five-year teaching career (which had been interrupted by a year off as a ski bum, followed by a year working in Paris). For the holiday season, I had taken a job in the downtown Rich's silver department. It was a gleaming area, near an entrance, and my mother had often stopped in there to buy a bride a piece of sterling flatware. I loved working there, looking at all the patterns. Once, a friend of mine's father came in. He was an oilman from Midland, Texas. He bought all the silver jiggers we had. They had coins on the bottom and one ridge around the middle. They were the perfect present for his business acquaintances, he said. But, I'm rambling now. My husband's law firm was located a couple of blocks away, so he came by to walk me to the car after work. Back then, there was a beautiful train station a level below the street near Rich's. I remember saying that it was November 18th, and it should not be so freezing cold. We were talking about what a handsome building it was, and we were shivering against the cold. It was already dark, and like this morning, it was unusually frigid with a stiff wind, made worse by being downtown. It was one of those moments, though, that I felt completely happy. I had the right husband, the best parents, a tiny cottage in the woods, and life seemed full of possibilities. I just saw on television a man talking about the happiness curve. It dips in your forties, and then starts back up in your fifties. That line did not veer that way for me. My husband was struck down suddenly just after his 56th birthday. I had just turned 54, and our girls were 22 and 15, and the years that followed were not good. But, the TV interview ended on a promising note. Apparently, you reach the peak of your happiness in your 70's. I have always been a hopeful person, thinking that something better is always around the next corner. The old Rich's is long gone, as is that beautiful train station. The thrill of shopping in downtown Atlanta is only a memory. But I like thinking of Novembers past, of chrysanthemums and cold spells and the simple happiness of walking in the frigid darkness along an Atlanta street. I still feel inside like that 19-year-old whose daddy stopped and bought her that big yellow mum. So, now that I've learned that life begins at 70, I'm actually looking forward to the years ahead. I honestly believe there will be some more good Novembers down the road. That's a comforting thought on this cold morning, remembering this same date almost four decades ago. I'm remembering last week and this rose in Margaret Moseley's garden. It's probably one of her collection of David Austin English roses. It was the last of the lovely days for a while. Margaret, 98, was looking happy walking through the garden, peering up at the sasanquas that are now 25 feet tall and enjoying the autumn colors of the halesia, the winged euonymus, the dogwoods and the Japanese maples. Her ginkgo had not turned yet, although I saw today that the ones at church and those all along the way have dropped their leaves. "My goodness. I can't believe I planted all that." On Tuesday, I went out to see Margaret Moseley. I had already been a few days earlier, but without my camera. I didn't have much time then and needed her to sign books. There she was, sitting at the kitchen table, opening each book to the correct page and signing confidently. At 98 and a half, she is sharp as a tack. All the while I was there, I kept looking out at the garden. Her daughter Carol and her high school friend W.M. have been working like Trojans, pulling weeds (most of the weeds are actually plants that some of us would love to have - they've just gotten out of hand in the garden). Meanwhile, Margaret goes out and finds it almost unbearable that she can no longer bend down and pull out anything undesirable. Also, she laments the fact that a lot of what she planted has disappeared. This might have happened anyway, given the way things do fade away over time. We are all familiar with that phenomenon. Still, the magic and beauty are still there, even in early November. It's the way the garden is planted. If I had had a 3/4-acre rectangle, you would be able to step out of the back door and see the entire back yard. But, Margaret didn't plant her space that way, with borders on the edges and lawn in the middle. Instead, she planted around trees (many are no longer there) and included evergreens that grew up to anchor these beds that were expanded over time. So, what you have is a series of secret gardens. Grass paths wind through the garden, past sasanquas and camellias that are 25 feet tall. This evergreen backdrop creates a series of hidden allees and secret gardens within a garden. 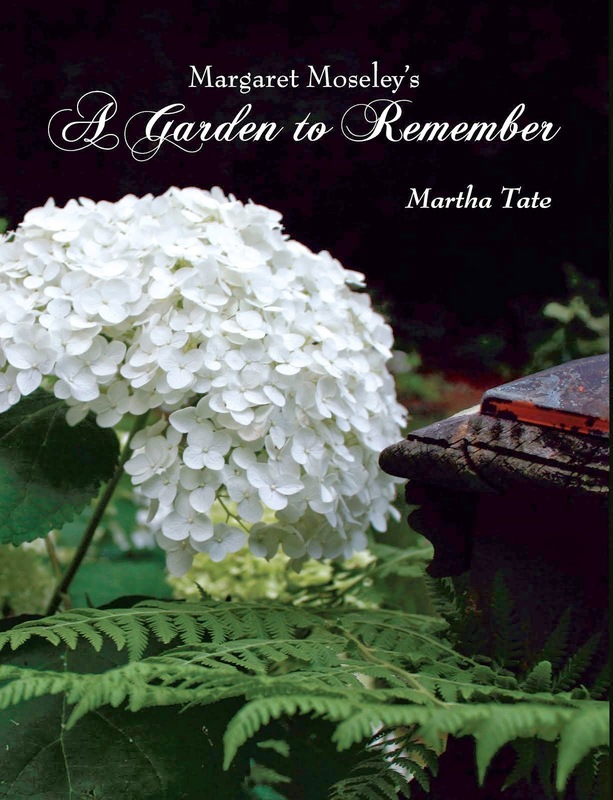 I am so thankful that I was able to capture just some of the wonderful plants and scenes in Margaret's garden in the book, Margaret Moseley's A Garden to Remember. In it are photographs of some of the best plants you can have in areas with similar climates to Atlanta. You can also see how Margaret had something in bloom every day of the year and delighted in every flower and leaf through all the seasons. I've gotten off-base here. What I wanted to say is that if someone were to follow Margaret's methods, and say, you don't have deer or that you have some barrier against them, I'm thinking you could add years to your life. The peak of Margaret's fame came when she was in her 80's and early 90's. I may not live that long, but I would like to have that joy Margaret found in going out every day working in her yard and every night dreaming about what she was going to plant next. I still love her words, "I wish everybody could have a garden." Note: My computer is slowing down, and one of the causes may be that I have 30,000 photographs - most of them of gardens and plants, a lot from flower arrangements at church, and only a few of family and friends (shameful!). What I think I'll do is try to post more often with just descriptions of what you're seeing. Then, at least once a week, if something merits a story, then I'll attach it to the photograph, just as I do now. What is happening is that life is getting in the way of my spending an entire morning writing and editing. That is what I like to do, not run errands or see to things that are broken and need repair or spend hours on the phone changing insurance companies that seem to take away the medicines you need just when you'd gotten used to having them, hassle-free. If you find it annoying to receive so many pictures under this new format, just zap your e-mail. At least you won't have to spend time reading my long ramblings. Let's see if this works, as it's hard for me not to launch into detail or tell a story about a plant. I'm realizing, though, that I can't possibly live long enough to show you even a fraction of the pictures I've taken through the years. I don't want to see them go to waste, as one or two might spark the imagination or introduce you to a plant you may want to hunt down. I think for Margaret, part of the fun was the thrill of the chase. If you don't have time or space to garden, you can perhaps just enjoy seeing the beauty others have created. That's sort of what I've done. Above: An unknown rose that came as a bonus when Margaret ordered her collection of David Austin English roses. It is so reliable, with the most beautiful buds, followed by this lovely open flower. It's in bloom from spring until the first freeze, which happened two days after I took this photograph earlier this week. Last Saturday morning, I went down to Georgia State University (I didn't know they owned so many tall buildings) where a special ceremony took place. When I got out of the car, a uniformed officer in the U.S. Army guided us to more young men in army fatigues. They, in turn, showed us the way to a lovely modern building where we took the elevator to a top floor. From there you could look out over Atlanta in every direction. The event was the dedication of an endowment fund for ROTC scholarships and education aids in memory of my beloved cousin, Colonel Lynn B. Stull, who died of a heart attack in February at the age of 67. Lynn and his brother were an integral part of my childhood. They were the only relatives on my Daddy's side even remotely my age. Lynn was a year younger, and his brother Terry was a year older than I. When they would drive up at Christmas or Thanksgiving or in summer, my heart would beat with excitement. We had the best time, playing all over our property in town. Later, when I was a young teen, I would drive them over to the farm in an Air Force jeep where I would perform ridiculous stunts, splashing through streams and bouncing over terraced fields. Terry and I, who were a lot alike, would gang up on Lynn, who was gruff and full of bravado. Once, we abandoned him in a pasture with a mean bull named Pudgy. Just as Lynn was about to attacked by the huge creature, I swung the jeep around, and he jumped aboard just in time. Terry and I often joke that we could possibly face eternal consequences from this one act. But Lynn survived and went on to earn an ROTC scholarship to Georgia State, where he was an outstanding student and leader. He was an infantry officer advisor in Vietnam and served with the Special Forces in the Pacific and Middle East. He was Director of Asian Studies at the U.S. Army War College and was Defense and Army Attache at the U.S. embassy in Malaysia. He went on to to earn his M.B.A. All in all, during his 31 years of service, he served with great distinction and honor. His brother Terry graduated from West Point and served two tours in Vietnam. He also retired as a U.S. Army Colonel. I will have to write about him at another time, as I can barely think of what happened to him over there, the close calls and his extraordinary bravery at the height of that war. So, today, I salute my cousins on this Veterans Day. I'm so proud of them both, and I am especially proud of this honor paid to Lynn. In addition, I am greatly relieved that something terrible did not happen to him that day in the pasture when an underage driver showing off could have prevented him from a stellar life as a revered officer and much-loved husband, father, grandfather and friend. I will love you forever, Lynn Stull. Flanders Field poppies: Plant in late fall in the South. Sprinkle seeds over completely bare ground in full sun, and spread a light film of pine straw over the bed to hold the seeds but let in the light. As I walked the residential streets of Charleston in early October (along with hoards of tourists), I had my new camera and took lots of pictures of "gardens." Actually, most were streetscapes, like this one. I was reminded once again of how big an impact can be accomplished with so little planting space. This photograph matches up with another one I took of the exact same house in 2007. Hardly anything had changed. There was no Clematis armandii draped on the column to the left as had been before (the fig vine was the same). The boxwoods (or are they Japanese hollies?) had grown more together under the window. Before, it looked like four separate shrubs. There was still the clipped Confederate jasmine framing the window and shutters and transom. And miraculously, those fastigiate hollies (I'm thinking 'Will Fleming') were still upright and standing as anchoring sentinels for that narrow strip. The only change was the perspective of the photograph. I didn't show what was around the corner to the right, next to the number 28. There is a brick facade with a wrought-iron sconce holding a lantern over a doorway. That was all still there, but I elected to show more of the espalier (the same shape as before) on the back wall. I think this is a case of, "If it's not broke, don't fix it." There's not an ounce of color except for the lush green of the foliage against the beautiful old brick and Charleston black/green shutters. But, just imagine what that white stucco wall would look like without this simple, but beautiful planting. On the trips to France and Italy, I was always struck by how a big, blousy rose could come out of a square in the pavement that measured only six by six inches and climb up two stories high. Sometimes, I think we forget that we could soften a wall or add interest to a door frame with a single plant. Simpler is not always better, but in many cases it is. I'm thinking that whoever owns this Charleston house has figured out that it's best to keep what works - an uncomplicated but attractive arrangement that is timeless and suits the space. Saturday morning, I woke up frozen in fear. The wind was howling outside. It was still dark, but I looked out and could see limbs above me going in every direction. I was positive one would hit my slate roof and also that the electricity would go out. Before daybreak, I ventured out, and even with my flashlight, I kept stumbling over branches down in the driveway. My dog was terrified and didn't go all the way to the street with me to retrieve the newspaper. The constant gusts continued all day long. Yesterday, everything was still, and I was able to finish picking up the twigs and branches that had fallen and could assess the damage. Most of the tulip poplar trees are leafless now, and there's more sun coming in my windows on the south side. I was extremely lucky, given all the big trees around here, that none fell on a structure. Meanwhile, I'm sure my friend, Japanese maple collector Bill Hudgins, was holding his breath. Over the years, he has grown out special seedlings he has chosen from his extensive three-acre collection. He evaluated all of them for fall and spring color and nurtured only those that resembled the named varieties. They are all in containers, which means they will color up and lose their leaves before the trees planted in the ground (many of the latter haven't begun to turn yet). Bill says that since he's lost his main helper to water hundreds of these trees, which are over six feet and well-branched, that he's offering them for a steal so he can make sure they get a good home. The trees are $18 each, which in the Japanese maple world, is crazy. Although he's sold tons in the last few days, he said this morning that he still has hundreds more at his house to sell. They're in three-gallon pots, and are much bigger than I had originally thought. Most are at least six feet tall. He said if you plant them in the ground this fall, they'll be spectacular by this time next year. Several friends called to tell me they had bought some and that they are beautiful. If you've ever bought a Japanese maple, you'll know that this is a steal and probably a once-in-a-lifetime event. Bill's fear is that with the wind and cold weather, the leaves on the potted plants won't stay much longer. Over the weekend, he did bring more to his shop, Lush Life, 46 E. Andrews Dr., Atlanta GA 30305. It's located just off West Paces Ferry Rd. in Buckhead, near the Atlanta History Center. The correct phone number is 404-841-9661. When those are sold, he has literally hundreds more. He's offering a cut rate if anyone wants a significant quantity. When I went over to Lush Life to take some books last week (you can buy Margaret Moseley's A Garden to Remember in the shop), I couldn't believe that so many of these maples not only had beautifully-colored leaves, but had lovely trunks of green or coral or a rich brown. Now, to Shelley's famous poem, Ode to the West Wind which I referenced in the title above. I don't know how many times I have wanted to use lines from this poem in this blog. But, every time I would read the poem through, I would remember that only the first and last lines - the most famous - are easily quotable. The imagery is mostly dark and gloomy or ghostly or speaks of death. I couldn't find one line that worked, although I do like: "O wild West Wind, thou breath Autumn's being," and of course: "If Winter comes, can Spring be far behind?" So back to the Japanese maples. I hope you can spread the word and find good homes for these beautiful trees before another "wild West Wind" comes through here again. Oh dear. I cannot spend any more time agonizing over which photograph to show from Bill Hudgins' amazing garden. Normally, there would not be a problem, since I could run different pictures on different days. But, I need to get this message out to anyone who has ever wanted a Japanese maple or who wants a tree that will give you three seasons of color. Let me back up. I've known Bill for over 20 years. 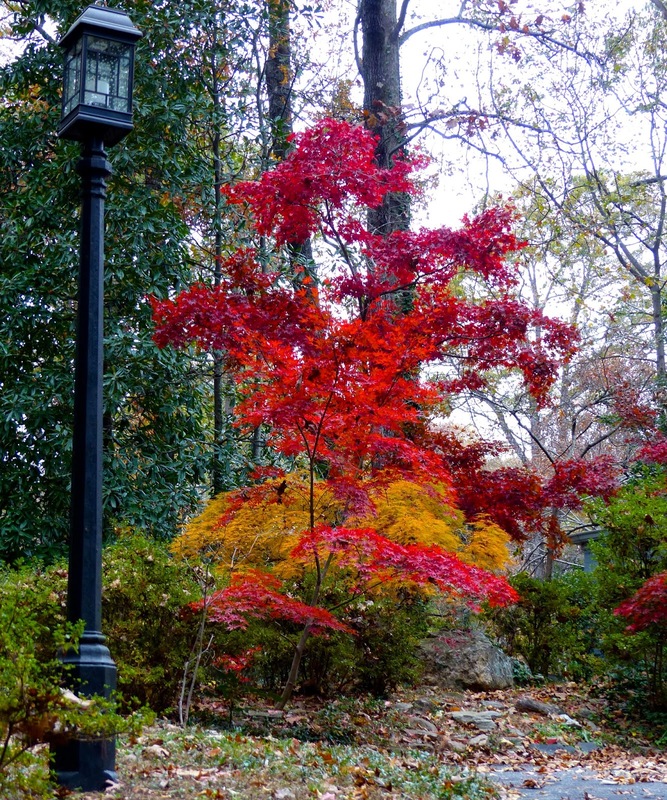 When he was in his early twenties, he fell in love with Japanese maples and started to collect them. He first had them at his home in Decatur, which was featured in Atlanta Homes & Lifestyles magazine when I wrote for that publication. Then, Bill outgrew the space and moved to a three-acre property in northwest Atlanta. He is surrounded by woods on all sides, so it looks like he has much more land than he actually owns. So, over the years, he added to his collection, traveling to Japan and studying how the trees were used in their parks and gardens. He kept planting, and then he started gathering and selecting seedlings and potting them up. This was all well and good, but now he's come to a point where he has hundreds of them, covering a steep hillside that is a riot of color in the spring and especially in the autumn. But Bill just lost some crucial help when one of his employees retired. The trees he selected are now four to six feet tall and come in brilliant autumn colors of red, yellow, orange and burgundy. These particular trees don't have names - or even numbers - but they are the result of Bill's discerning eye for the showiest colors and leaf form. The good news for Japanese maple lovers is that Bill is now selling the trees at a "steal," as he called it (and it is, even by my frugal standards). He can't keep watering hundreds and hundreds of trees, and he wants to share his bounty with other gardeners who would appreciate them. The maples are all in three-gallon pots and can be planted in the ground or in large containers for anyone with limited space. My own heart is beating so fast right now, thinking of all those beautiful trees and how I'd like to create a woodland like he has, that literally glows about this time every year. The maples are available at Bill's store, Lush Life in Buckhead. The address is 146 East Andrews Drive, Atlanta 30305; Ph. 404-841-9661. Of course, now is a good time to select the trees, which come in fall colors of orange, yellow and red. Bill has his in open woodland, and in 2012, I took 240 photographs in one day there. I remember saying that my heart was on fire. I ended up going back two days later and taking over a hundred more pictures. There was just that much beauty. I sound like some sort of salesman (which I am not; I would starve if I had to do that for a living), but this is a once-in-a-lifetime (of Bill's life anyway) to obtain some beautiful trees for your property. A word about the above photograph. I flagged sixty to choose from. Finally, after I realized that half the day had passed, I selected this one, turning down some red, yellow and orange trees that would have burned your eyes. It's just too hard to explain unless you walk through his garden and point your camera up to the sky and see those leaves backlit from the sun. I can't think of anything more beautiful. I hope some of you will get to have some of this beauty. Feel free to share this with friends. Note: If you are on this Web site, write Bill Hudgins' name in the white bar at the top left to see more of his garden. Yesterday morning on my way to church, I was speeding up my gravel drive when a young doe jumped out of the bamboo and in front of my car. I slammed on the brakes and skidded, missing her by inches, if not an inch. I stopped totally, fearing there were more deer to follow, which there often are. She was alone, though, unless some smarter ones stopped when they saw me. I did have to explain to the man who was walking his dog on the street what the commotion was all about. He had just seen several in his woods across the street. So, I was looking through photographs of Ryan Gainey's garden to find a shot I took of his 'Graham Blandy' boxwoods so I could talk about some that I just bought (the post will have to wait now), when I came across this picture. Now that deer are a constant presence all around my house, hostas don't have a chance. All had been okay up at the little house, but at the end of the summer, I fell down on my spraying routine. Everything got shredded, including a huge 'Sum and Substance' Margaret Moseley gave me years ago, way before the deer came. When I saw the above photograph, a light bulb went off. I have these same two cement containers, and they've been sitting empty on my side patio for years. I don't have a place I can put columns that would be high enough to avoid the deer (they don't mind standing on their hind legs, I've noticed). But, I could have the containers brought around to the back terrace where I only have the chipmunks and squirrels to contend with. It would mean dividing the hosta, which probably needs it anyway. Amazingly, I think the root structure is still pretty large, despite the defoliation each year. Here's the only problem. In the late spring and summer, this is my only sunny spot on the entire four acres (not counting the slope at the little house, which will be addressed when my ship comes in). I know that 'Sum and Substance' can take a bit more sun than other hostas. Still, I would have to position the containers where they'd get some sort of shade in the afternoon, maybe from the other plants I have out there. What I think I'll do is go ahead and take up the hosta (I'll probably need an ax, it's so large: also, what to do with the other blue ones? They're the last to be eaten during the season) and get them planted. Then, I'll have a while to figure out where to put them. As I write this, I'm getting more excited about this prospect. It just dawned on me that I could place them in front of the arborvitae where they've be shaded from the western afternoon sun. That will give me another texture out there, and they'll be seen from the front door (my hall goes all the way through to French doors that lead to the terrace (a fancy word for what is really a concrete deck). I did not even realize I had this photograph from Ryan's garden, so I consider it a lucky find. Now, to go back and look at the rest of the pictures I took that same day to find the one I needed. I'm so excited that I've already forgotten the gist of what I wanted to say about the boxwoods. It will come back, I think. The exquisite hydrangea you see above is one I've coveted for years. When I was down at Wilkerson Mill Gardens near Palmetto (my home town) a couple of weeks ago, I snapped this photograph of Hydrangea involucrata, which has the loveliest soft (to the touch) grayish foliage and muted lavender flowers. Even after it has reached its peak, the blooms are still beautiful, fading to creamy white. According to Elizabeth Dean, co-owner of the nursery with her husband Gene Griffith, the Japanese name for this variety is 'Tama Azisai', Tama meaning "ball" and Azisai, "hydrangea." The ball refers not to the open blooms but to the ball-shaped buds. If you look closely, you can pick out a few of these latter. I must say there are so many treasures at this wonderful nursery (see Hydrangea.com for their offerings). I rode up to the mountains last weekend with Lyndy Broder, who has an amazing collection of plants in her multi-acre garden in the countryside near Stockbridge. So many she found at Wilkerson Mill Gardens. Back when you couldn't locate anything unusual, Elizabeth and Gene would have it. You could always find something beautiful and out-of-the-ordinary. This photograph illustrates how a single hydrangea can add great beauty to a landscape, even as the season wanes. I just stood there transfixed at the combination of muted colors and the delicate nature of the blooms. I'm adding this to my wish list, no matter if it never gets to be the size shown here in my lifetime. I always think of Margaret Moseley, who through her eighties and into her nineties kept planting things she had read about or seen somewhere. Just this past year, she put in several 'Limelight' hydrangeas. At 98 years old, she's raving about their blooms and how quickly they grow, so I guess it's never too late to be thrilled by a new plant in your garden. There's nothing like strolling through the streets of historic Charleston on a beautiful day. The only thing was there were so many tourists. But then, what was I? You're still a tourist even if you are there to attend a wedding (and what a wedding - I'm still kicking myself for forgetting my camera to record the gorgeous tent, the amazing flowers and candles and greenery-draped chandeliers and monogrammed linen cocktail napkins!). Anyway, on Saturday morning, I took off under a bright, sunny sky. A front had come through the night before, and it was actually chilly. I walked first to find the church so I'd know exactly where I was going that afternoon. On the way, you could hear the clip-clop of horse-drawn carriages. Sometimes, I'd follow along and stop when they did, listening to the history lessons. I passed the scene above, obviously spying through the gate (I like it when Charleston residents give you a glimpse into their alleyways and narrow gardens). It was a difficult day for photography, because it was bright and crisp, and every shadow was sharp in the harsh light. Thus, this swimming pool looks striped. Still, you can get the idea of the small, but striking landscape. I did find the lovely old Episcopal church. It was just across the street from a garden we featured on A Gardener's Diary on HGTV. I peeked inside that garden, too, and admired the old roses in bloom. There was tropical vine I was not familiar with, blooming on the fence. My walk lasted three hours, and I was able to take pictures of gardens I'd photographed in 2007. It still amazes me how so much can be done with so little space. You'll see a wall covered with Confederate jasmine, and the whole plant is coming from one little opening in the sidewalk. When it was time for the wedding, my daughter and I took a bicycle rickshaw to the church (my other daughter was a bridesmaid). As we were dodging traffic, I glimpsed some gardens I'd missed. I saw just enough to make me want to go back to Charleston. I don't think I can ever get enough of peering through iron gates or openings in brick walls to see all the treasures hidden there. Something happened yesterday. The man who tends the garden above appeared at my house in mid-morning, asking if I needed any work done. He had finished a project in the pictured garden, which started out as large boxwood parterres (this being the largest) filled with seasonal flowers, clipped bay trees, roses and on and on. Apparently, as the owner added other areas (like a fenced-in cutting garden, a chicken coop and an area for designer goats), the parterres were simplified. This one is still beautiful, but in a different, more serene way. The garden has evolved over time in an unexpected direction. Back at my house, I was thrilled to have some help. It's so rare that this man has any time, given the demand for his services. A few weeks ago, he had brought some of my cobblestones from the farm, in anticipation of adding a small garden area opposite the arch garden. This new, undeveloped triangular space is where this same man planted my mother's purple hydrangea and a boxwood. On one side is a wild magnolia that separated the area from my bird feeding operation. The branches of the magnolia came almost to the ground (you had to duck to get under them), but they were where the cardinals, who had basically taken over the feeders, perch awaiting their turn. So, I had been doing something in the house (another man who came with him was pressure washing the concrete deck, which desperately needed it), when I walked out to talk about the new space. I almost fainted. The man had limbed up the magnolia, so much so that I had to look up at the branches. My heart sank. The deed was done. Where were the cardinals going to gather and be protected from the eyes of hawks? Not to mention, that the space looked so bare and exposed now. "Plants won't grow here if you don't let sunlight in," he explained. "You have a boxwood in one corner, and you need two more here and here. This way you'll have enough light to have a little garden." He was right about that. Nothing could have grown under those magnolia branches. Also, he couldn't cut one side of the tree and leave the other. Still, I went out this morning to feed the birds, having imagined last evening that not nearly as many showed up, and it all still looks so bare to me. This incident is like so many others that have happened to me and to anyone with a garden and occasional help. You don't anticipate that someone would go off on a notion of their own. I couldn't have dreamed that this man would have cut all those magnolia branches. Just wouldn't have crossed my mind. I think it was last year that 98-year-old Margaret Moseley went out with a helper to show him a branch of a camellia that had grown over some other plants. She wanted only that one limb removed. Later, she went out to discover that the entire six-foot-tall bush had been cut to the ground. So, I'll trust that the man is right, that I couldn't have grown anything along the cobblestone border he put in where the magnolia had blocked the light. My neighbor came by after he had gone and said she thought the cardinals would adjust. They can still perch in the magnolia, but it will be much higher. And, they still have the osmanthus, the shelf rock and a small weed tree I keep trimmed for them as a perch. I've noticed, though, that this new arrangement has emboldened the chickadees and the titmice. They're the ones dominating the feeders this morning. Back to the positives. I can now have two more boxwoods which will tie the new space to the arch garden directly across the path. I'm also comforted by the thought that the woman who owns the magnificent garden shown above puts all her faith in this man. He is the sole keeper of her huge yard and probably uses his own intuition a lot of the time. I think once I get over the shock of the bareness, I'll be glad it happened. I'm always grousing about not having enough sun. Now, at least in this little corner, that won't be the case. In September of last year, I wrote a post about a yellow lycoris that popped up seemingly out of nowhere at my house. If you type "yellow lycoris" in the search box at the top, you'll pull up the blog dated September 27, 2013. That single stalk was next to a narrow path that leads to my brush pile. It could have flowered there before, but I don't think so. I go back there fairly often and would have seen it in some stage of bloom. I wrote on that day that I wouldn't have been too surprised if it had been a red spider lily (Lycoris radiata). I have a few at the little house that someone planted long ago. Also, they're just not that rare. I've been seeing them around in yards for at least a month now. But, I'm retracting that statement. I certainly was taken by surprise. About a week and a half ago, I walked outside my basement door where I saw these three stalks blooming together. They came up in a patch of Siberian iris Priscilla Glass gave me over 30 years ago. I am positive that these flowers have never bloomed here before. So, now I'm wondering. I used to order things from the ads in the Farmers and Consumers Market Bulletin, published by the Georgia Department of Agriculture. Sometimes, if I ordered a bulb, it would be so small that I had no hope of its maturing until I was in my sunset years. That wasn't always the case, but it did happen a few times. I would be lucky to have foliage come up eventually; many just never flowered and then altogether disappeared. I am trying to figure out if indeed a tiny bulblet could have been contained in the soil of Priscilla's gift, and it took 32 years to mature to a blooming size. I am over a 150 yards, maybe even 200 yards, away from the little house. I have some pink naked ladies (Lycoris squamigera) up there that bloom in July. There's never been a lycoris up here except for said yellow one that was nowhere to be seen this year (when I went looking for it a couple of weeks ago, I did find a splintered, rotten limb near or maybe right on top of the place where it had appeared last year; nothing could have gotten up through all that; I cleared it all out, but still no yellow surprise). I'm tempted to call up Priscilla and ask her if she has ever had red spider lilies. But, am I foolish to think it would take over 30 years for a tiny bulb to grow to blooming size? Those bulbs aren't all that large, anyway. I think this occurrence will remain a mystery. This coming winter, I'll look for some strappy leaves to appear. The Siberian iris pretty much die down then, so I think I'll know. I don't dare divide and disturb them, because I won't be able to wait another 30 years to see them flower again. A gift of fragrance, but what to do? Well, I couldn't believe it. After working on this blog post for a good two hours yesterday, I tried to see what the photograph and text would look like on the finished page. But, every time I tried, an error message came up. This computer has been having trouble lately, with lots of turning beach balls. So, I thought I should close some windows, shut it down and see if that helped. When I went to close up the blog, it wouldn't let me. It warned me that something might be lost if I did so. But I was stuck. I couldn't do anything. Normally, I would copy the text, but I didn't. Always before, even if you leave the page and come back later, the text and picture are still there. Not this time. Sorry to burden you with this, but I know I won't be able to re-create my spiel. In brief, the story was about that orange tree you see above, how I came home from New York on the evening of September 20th, got out of the car in front of my house and was bowled over by the heavenly fragrance. I couldn't believe the perfume had wafted all the way around the house. The next morning, I got up to see the shrub/tree loaded with tiny orange blossoms running up and down the branches. Erica Glasener, host of HGTV's A Gardener's Diary and an esteemed horticulturist and lecturer, gave the plant - Osmanthus fragrans var. aurantiacus (orange tea olive) - when its trunk was the size of a pencil. Normally, when someone would give me a plant, I would put it right in the ground. With things I bought, I was not so quick. I let my penchant for indecision take over, thus keeping some plants for years, dragging them in and out of the basement during very cold snaps and watering them in their containers in the summer. It was ridiculous and a very bad habit. Sometimes, I would lose plants, which was a waste of precious growing years, not to mention money. Other times, the plants would root where I put them. That was the case of Erica's gift. It lived in its one-gallon container for years, blooming heroically every September. That's how it came to be where it is - in the new arch garden (you are seeing it from the far end, looking toward the front corner of the house). I left it there, and it rooted. I finally cut the plastic pot off, and it grew too large to move, so we built everything around it. The plan was to shape it so that it would cover the iron arch next to it. Now, I'm unable to summon the nerve to take the loppers to it. I thought I would cut it back at the end of October when my team has the flowers to do at church. The stiff branches and glossy foliage would make a great background for our arrangements. But, is this the time to prune it? Jack Driskell, a self-described plant nerd with a fabulous garden, has the same plant. I'm hoping he sees this and will tell me if you treat fall blooming evergreens like you would the flowering shrubs of spring. That is, do you prune right after they bloom? Will new foliage pop out and get killed by the freezes of December and January? I just received another warning, so I'm going to copy this text just in case. Another time, I will tell about the superiority of this plant (for several years, I've had what is supposed to be the most fragrant of all tea olives; it went into the ground immediately, but never grew; I moved it, and it seemed happier; little white balls formed this year, but then fell off. The species O. fragrans I bought at an outlet seems ready to bloom; we'll see if its fragrance lives up to its botanical name). One last word: If you see this orange osmanthus, buy it. It's unusual, reliably fragrant, so much so that it perfumes an entire yard in September. Its blossoms are dropping now, but still that delightful scent was in the air this morning when I went out to feed the birds. The winning shade garden and a ghost? It turns out that on my walks through the streets of Cobble Hill and Carroll Gardens in Brooklyn, New York, I was not able to capture large scenes. This was due to the fact that wrought iron fences - many of them quite old and stunning - kept me from getting an entire view. I had a fairly decent photograph of this winning shade garden (I was rating all the gardens I saw, and this one was the best one for shade), which had interesting plants and was well-kept, but the fence (thick, black wrought iron with a fleur-de-lis pattern) showed up clear, and the background was fuzzy. So, we're going to have to depend on our ability to picture what this front yard looked like, using only my description. What you can't see here is this: a large area between the fence and this hosta grouping at the base of a cherry tree was covered in the mat-like, yellow creeping jenny (Lysimachia nummularia 'Aurea'). There wasn't a flower in sight (only two lily stalks, long bloomed out), but there were many textures and colors of green and chartreuse that made the garden look sort of like a tapestry. On the left in the foreground are the leaves of hellebores. On the right is a light green acorus. I don't know the name of the main hosta here - seems like there are several that have these particular markings and coloration. I'm pretty sure, though, that growing just to the back of it is Hosta 'Sagae'. There was a camellia in the background, and you can see that there were also ferns - several, in fact. Flanking the steps to the brownstone were two large, spreading Hydrangea macrophylla, but no flowers. Near the fence was a heuchera with bluish foliage. Next to it, as far as I could tell from my photograph, was a miniature rhododendron. I can't be sure about that - it seemed too compact - but it was a good, heavy textured leaf next to the more delicate ones of the heuchera. What I can't figure out is the "ghost" in the background between the hosta leaf and the fern. I took several pictures of this exact scene, and in only this one is a smoky-looking mist that looks as if something were wrong with my camera lens. That could have been the case, although nothing shows up anywhere else. I choose to believe that it was the spirit of a 19th-century woman, fresh off the boat from Norway, who lived in this house and tended its front garden, which I'm sure looked very different back then. While I was in Brooklyn, New York, with my new granddaughter, I read several baby books, including Bringing Up Bebe by Pamela Druckerman, about how French women deal with their newborns and toddlers. The author is American, but has raised her children in Paris. In one section, she talked about the contrast with some modern American parents. She cited Park Slope, an upscale area in Brooklyn, as Ground Zero for helicopter types who hover over every word and action of their children. Her description of these new-fangled American rituals (I took this as likely peculiar to New York City and environs, but then I don't really know) was funny. Apparently, it's in vogue to tell your child exactly what she or he is doing at every moment. On a visit to New York, the author had been at a play area in a New York park (Prospect Park or Central Park - I can't remember) and watched as an intense sort of father served as commentator for his child, announcing the toddler's every move on the slide and other play areas. "You are now coming down the slide." "You're climbing up the ladder" and so on. I thought she was exaggerating until I stood taking this photograph in front of a brownstone on Clinton Street, between Carroll Gardens and Cobble Hill. "This is a coleus," a woman's voice behind me said. I didn't look around at first to see whom she was addressing. "It's a summer annual, and it is grown for its brightly-colored leaves." I turned my head and almost gasped. She was talking to a boy who looked to be barely three. He had a tiny scooter with two wheels on the front and a pint-sized helmet. "It's planted around a boxwood," she continued. By her diction and lecture stance, she could have been leading a novice class of horticulturists. "What colors do you see?" At least this sounded more reasonable. The little boy was silent. "Tell me what the color is in the middle." "Red," the little boy said in a guessing-like tone. "Almost," she answered. "We call that color deep cerise. What do you think that other color is?" I waited for a terrible moment, feeling sorry for the little boy. He said "green," in a shy, questioning tone, but very sweetly, she said, "Close enough. It's chartreuse. It's a cross between yellow and green. See?" I have to pause here to say that when my older daughter was only two, I drilled her on which flower was a zinnia and which was a cosmos. When she had mastered the concept, I thought she was brilliant. I was probably no different in my quest to educate my daughter so she'd be sure to get into a good college. At any rate, I guess I wouldn't have paid much attention to the exchange if I hadn't just read that book. The woman asked if the little boy thought it was pretty, and to my amazement, he said, "It's the prettiest one I've ever seen," and then they were off, as the light on the cross street lit up that it was okay to walk. As I said in an earlier post, to make my walks more interesting, I ran a sort of contest, picking out the best garden scenes or window boxes or planters. I've never thought much about coleus (it can be garishly misused, in my opinion), but my friend Benjie gave me a lovely bi-colored green one that I kept in water over a couple of winters and put in a container again in spring. I think the little boy was right. This was the prettiest coleus in Brooklyn, or at least on Clinton Street. I walked by there several times during my stay, and saw others stop to admire the plants (there was a matching one on the other side of the steps). There's nothing quite like the combination of chartreuse and deep cerise. I hope that little boy gets into Harvard, and I hope that if I go back there next year, the owner of these planters will have saved this eye-catching plant. Walking around the Carroll Gardens/Cobble Hill areas in Brooklyn, New York, I've made up a sort of contest. Not that people-watching is not enough, but I'm forever interested in which plants are used and how they've been arranged. Most of the brownstones that make up the bulk of the houses in the area have only stoops and a tiny space in front. Thus, I have a window box contest, a "best hosta" category, most attractive shade garden - so many of them seem to be in deep shade - and "best containers on steps"; sycamore (or are they London plane?) and ginkgo trees line many of the one-way streets, casting deep shade. I'm always surprised when I see a bright red geranium growing in what seems at five o'clock in the afternoon a very dark place. 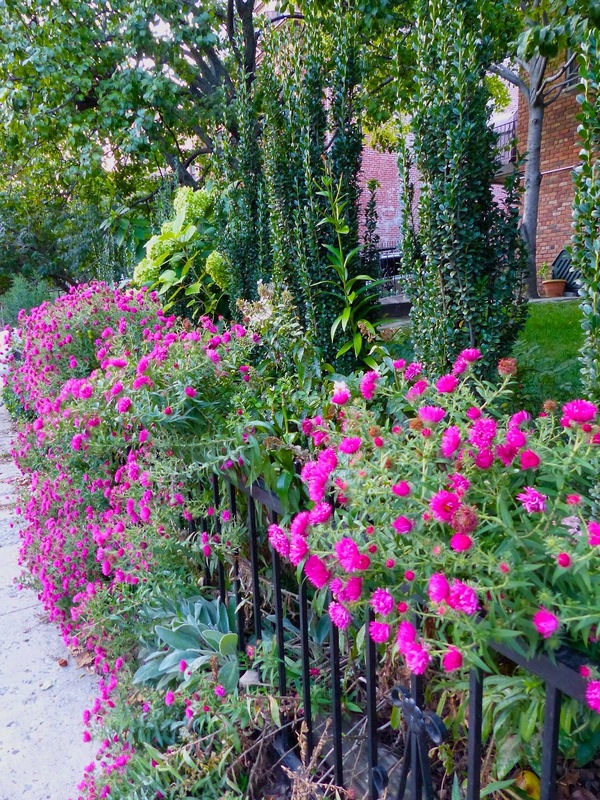 The above is the only candidate in its category, which is "best fence planting in Carroll Gardens." This area, as I mentioned in a previous post, has large rectangular spaces in front of the tall houses. The one here had a lawn taking up most of the area, so there was only the part along the fence that had much interest. Other gardens might have qualified, but the roses or coneflowers or iris were long spent. They would have looked good at another season. The glowing hot pink you see here is some sort of aster. The lamb's ear along the sidewalk adds a touch of blue. There's a 'Limelight' hydrangea planting among a row of Ilex 'Sky Pencil.' I thought this was a good use of this latter evergreen, which so often looks lonesome and stark out growing by itself. You can see that earlier in the summer an Oriental lily bloomed along with some garden phlox. I still have a few more streets to cover, but in general, the spaces intended for gardens have been a bit disappointing. I have to think that the people in charge may have once had time or strength to keep a garden up, but not anymore. And, it's not really fair to judge the gardens in September. It's obvious that I missed a lot of mophead hydrangeas and many roses and other perennials. And, I can't count the vegetable garden someone planted. It's really well-done, with beans still going along the iron fence. But, it's not photogenic at the moment. I bet it was back in late July/early August. I guess it exists mostly in the old cities like Savannah, Charleston and New York, but I'm wishing I could have some of the handsome ironwork I've seen here back home in Atlanta. Walking in my daughter's neighborhood of Carroll Gardens in Brooklyn, one can see examples of exquisite work done long ago. When my younger daughter lived in Manhattan, she had her tonsils removed. I remember riding home from the hospital and noticing how many iron fences there were, even in front of decrepit industrial sites along the FDR. It's pretty amazing that so much of it has survived. Of course, if you have this surround in place, you have a head start on a lovely garden. I have to say that many of these rectangular spaces in front of the old brownstones don't live up to their potential, to my mind. On my daily walk, I do a lot of mental landscaping. Most of the gardens are well planted, but a few are totally neglected, with weeds and a smattering of dried-up evergreens. Others are a mish-mash of vernacular tastes. The block where the above garden is located has a mix of both charming gardens and ones that need work. Some are still owned by Italians who settled here at the turn of the last century, so you'll see a garden that is nicely arranged, but there will be a shrine in the corner that is a bit startling. I guess I'm just not used to seeing this sort of thing. In fact, there's a restaurant on the corner with a canopy of grape vine (with heavy clusters of purple grapes) that looks for all the world like it should be in Provence. I tried to take a picture, but there's a white shrine to the Virgin Mary that almost glows in the shade of the courtyard. In this historic district that was founded in the early part of the 19th Century by Irish immigrants and then Norwegians, it was required that the houses along certain streets be set back 33 feet to accommodate front gardens (unlike the fronts of other brownstones in Brooklyn which are much closer to the street). A lot of the former still retain beautiful iron fences and gates, like the one above. I can't help but wonder what it would be like to have this defined space. Would I mess it up by trying to do too much, or would I restrain myself to a few choice plants that would bloom throughout the season? Whoever did the garden above opted for pretty low maintenance, but managed to include a few striking plants that blend well with the beautiful ironwork. The flavor of the neighborhood is changing. Many French people have moved into Carroll Gardens since the 1990's. I don't know that any of them will ever own these houses, some of which have been passed down through generations (and are obscenely expensive to buy), but it would be interesting to see their take on garden design in such a space, given that so many French gardens have high walls and fences. On the morning of September 11, 2001, I had gone to work early, just up the driveway from my house in Atlanta. We were editing one of our episodes of A Gardener's Diary on HGTV. My fellow producer and I were there with the editor, immersed in watching what was happening in a garden in the Midwest. All of a sudden I realized I needed to run over to the shopping center to pick up something from the drugstore. As I reached the pharmacy counter, several employees were gathered around a radio. I heard them say that a plane had just crashed into the Pentagon. I asked what they were talking about. They told me about New York. My heart stopped. As they were describing what had happened, I was seized with fear that the strikes would continue up the island of Manhattan. My then 23-year-old daughter was there somewhere. Two weeks before, she had moved out of an apartment in TriBeCa at the corner of Duane and Church, six blocks from the World Trade Center. If you walked out the door of the building and looked straight down Church Street, you had a great view of the twin towers. This location turned out to be where most of the major news stations set up in the following days. It's also where the photograph for the iconic black, shadowy cover of The New Yorker was taken. On that foldout, you could see the entrance to the apartment. At that moment, Anne was working in Greenwich Village and staying on the Upper West Side with a friend. I called and called, but all the circuits were busy. I drove back home and turned on the television. Then, I went back up to the cottage, where the editor and my business partner were serenely watching footage of the garden. They hadn't heard yet. When I went back home, there was a message from my daughter. "I'm okay," she said. Like so many other Manhattanites, she had left work and started walking uptown, all the way to her friend's apartment on 83rd Street next to Central Park. I kept that message for years, until it was somehow inadvertently erased. A few days before, on September 6, 2001, I was returning from a trip to France. As we were landing at Newark, I could see Manhattan off in the distance and the twin towers looming at the end of the island. I thought of the previous July and the engagement party I'd attended at Windows on the World. It had been a magical weekend. My daughters and I stayed at a hotel overlooking the plaza. We spied the bride-to-be coming out of the Krispy Kreme store on the first floor of one of the towers. We shopped at the Banana Republic underground, and my younger daughter bought books at Borders. That night, we took an elevator to the top of the North Tower. It was twilight when we arrived after the dizzying ascent. The sun was setting, and a rosy haze hung over the Statue of Liberty. When dark fell, we looked uptown to a breathtaking view. The lights of Manhattan were sparkling below us in the night. It all felt so close, very surreal. The party was fabulous. My dearest friend from elementary school, Linda Jackson Carter, and her husband Bill were the hosts. It was the treat of a lifetime. Late yesterday afternoon, I walked to the new park at the Brooklyn Bridge. I passed soccer fields jutting out into the East River. Young people were playing racquetball or basketball on another wide concrete pier. There are all sorts of paths and benches to enjoy the vista. You can see the Statue of Liberty off to the left. Straight ahead is the tip end of Manhattan, with the Freedom Tower jutting up above the other buildings. To the right are the majestic stone towers of the Brooklyn Bridge, which has been suspended across the river since 1883. There weren't a lot of flowers in bloom yesterday, but I spied this rugosa rose along a bike path. I bent down to catch its delicious fragrance. I turned my head and realized that if this scrappy bloom had been there on September 11, 2001, what it would have witnessed on that terrible day. I'm sure you remember where you were when you were stunned by the news. In our wildest dreams, we could never have imagined this horror in our land. I remember thinking that the world would never be the same, and of course, it hasn't been, really. But, as I watched the children running about and couples sitting on a grassy knoll looking out on the river and joggers getting their exercise after work, it heartened me a little, even though I felt the sadness of the loss of all those souls and of our uncertain safety way down deep inside. I hope that those expecting a garden scene will forgive me. My daughter put together this nursery for my new granddaughter, born a week ago. The reason I'm posting it here is so she can pin it to her Pinterest board. I apologize to all who were expecting something to do with flowers and gardens and to those who have already seen this on Facebook. I'm about to write something about gardens, so thank you for your patience!